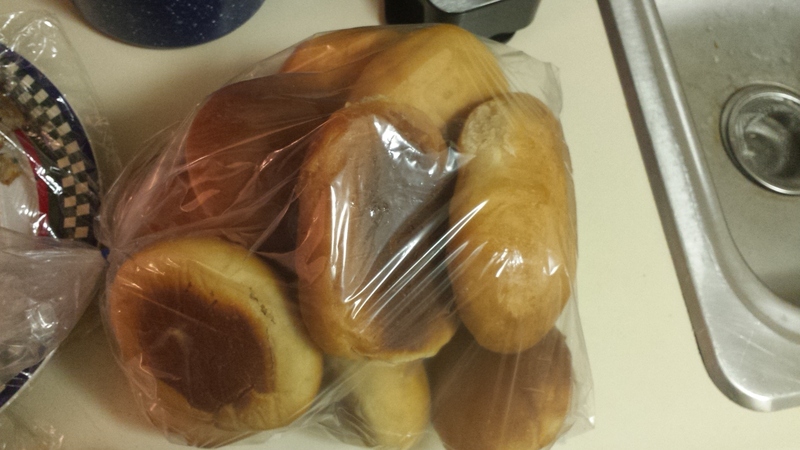 They are glorious, so good…and if you wanted to make regular bread you can. It’s a simple recipe and always turns out great. Dissolve yeast in 1/2 cup warm water. Add flour, salt and sugar; stir in 2 cups of warm water. jar in the refrigerator and occasionally shake jar to mix. bread as desired, letting rise again covered until double. Bake at 375 degrees for about 30 – 35 minutes. I made it into a bundt cake instead of muffins, and it turned out way better, although I had to bake it a lot longer, almost an hour. You can find the recipe here. Mix cooked beef, spaghetti sauce, and tomato soup together. Mix cottage cheese and 1 1/2 cups mozzarella cheese together with Italian seasonings (garlic powder, onion powder, basil, oregano etc). Layer as follows: meat mixture, lasagna noodles (uncooked), cheese mixture (repeat 3 times) and top with remaining mozzarella cheese. Cook on high for about 1 1/2 hours and turn down to low for 2 1/2 more hours or until done. I have to admit that this recipe gave me anxiety, because you have to work and adjust the noodles to fit. I didn’t like it. But it tasted fabulous and it was a big hit!!! We are in the middle of a mini snow storm. 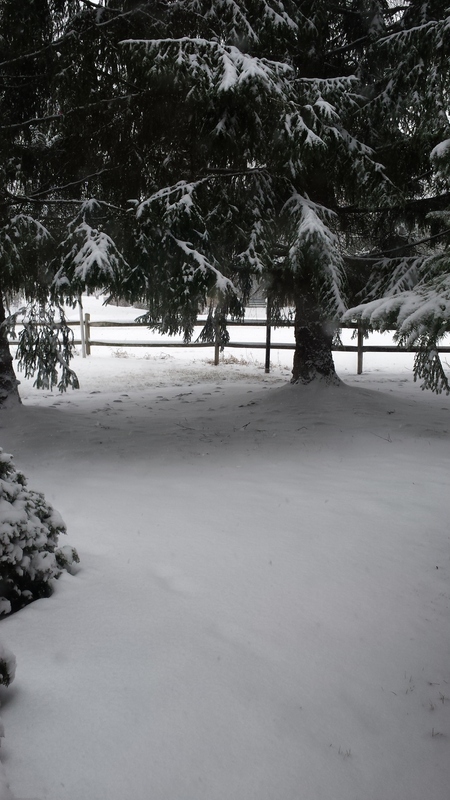 It’s cold, windy and snowy out. Yesterday I ran errands and got a few things for the week. I am not a big fan of grocery shopping, so I tend to only really go on a big shopping trip every 2-3 months. When I do that, I stock up. And I mean stock up. I spend about $400 to stock up my pantry and freezer and pick up fresh items every week or other week. So, yesterday I needed to get some stuff for a potluck at work this week (I am making crock pot lasagna…more on that this week) and some items for this week. I wanted to make some queso so needed a few things. After I got home, what I had in mind for dinner quickly went out the window, and I ended up making one of my favorite salads. 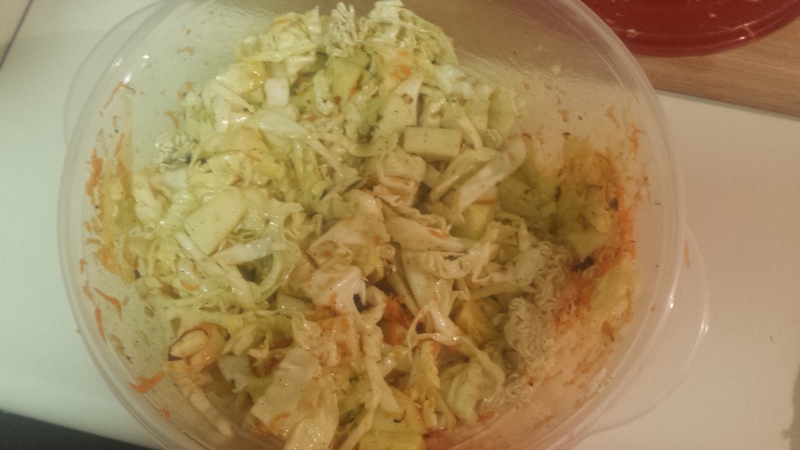 It’s a version of Cabbage Crunch Salad–and it was so yummy. Today, I made some homemade refried beans (you can find the recipe by clicking here), and some queso dip. The queso is super easy…just take a block of velveeta cheese, a can of rotel, and some browned ground beef and mix it in a crock pot. Let it melt together and it’s perfect for a dip or for a snack or for dinner. So that’s what I did today. Check out the blog later this week for crock pot lasagna! 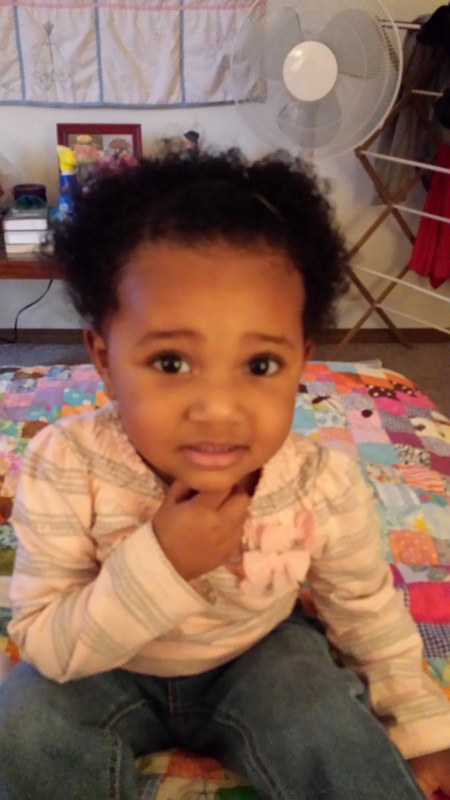 and let me just say this girl…she is full of life and energy and personality!!!! I love her soo much! Anyway, today I didn’t get to sorting my fabric, but I did spend some time cooking and baking. Last year for Christmas, my parents gave me a chest freezer, and so for the last year, I have been obsessing about freezing things. It’s changed how I grocery shop and cook! A couple of weeks ago, I was cleaning out the freezer and was amazed at how much stuff was in there. So…I have been trying to cook and eat out of the freezer. Today, I made this winter stew that my Mom used to make when I was a kid. How I made it: I browned 1 pound of ground beef and added about 3/4 cup of beef broth, a diced onion, minced garlic, salt and pepper. I had some whole frozen tomatoes from my Dad’s garden that I froze this summer, and I dipped them in simmering water to remove the skin. I rough chopped the tomatoes and added them to the skillet. 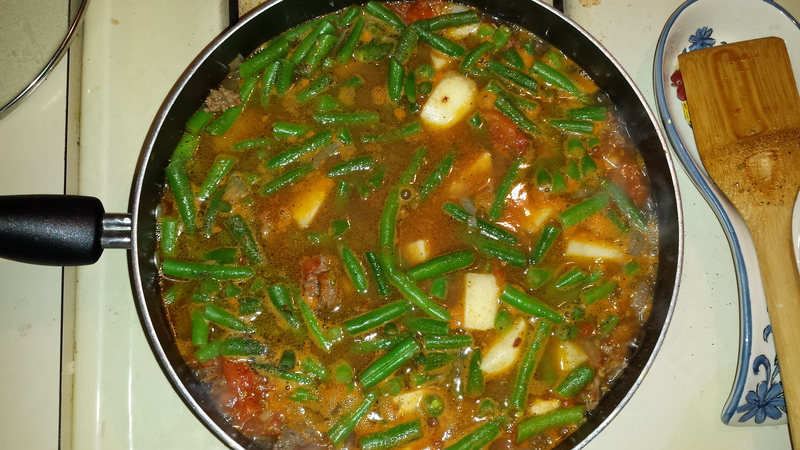 Then I added 4 peeled, roughly chopped potatoes (also from my Dad’s garden), and about 2 cups of chopped green beans (I bought those at the end of the harvest season at a farmers market on sale…another added bonus of a freezer!). I added a little bit more salt and pepper, stirred it up, and covered it. I kept it at a low simmer and it was done in about 30 minutes. 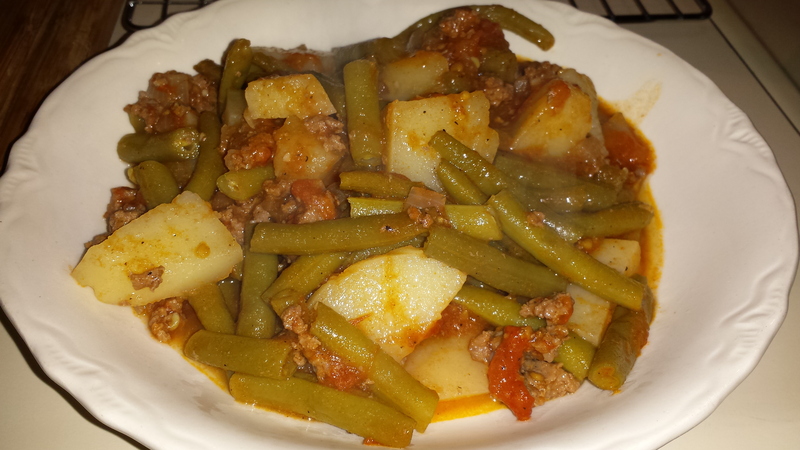 It is a great one pot meal and is hearty and warm for a cold winter day! Then, I thought I would make some blueberry muffins. I had some blueberries that I bought (also on sale at the end of the season at the farmers market and froze). This was not a complete success…in fact, it was kinda a flop. Mix the butter, sugar, sour cream, eggs, milk, lemon extract until well blended. Add the flour, baking soda, baking powder and salt until just blended. Try not to overmix. 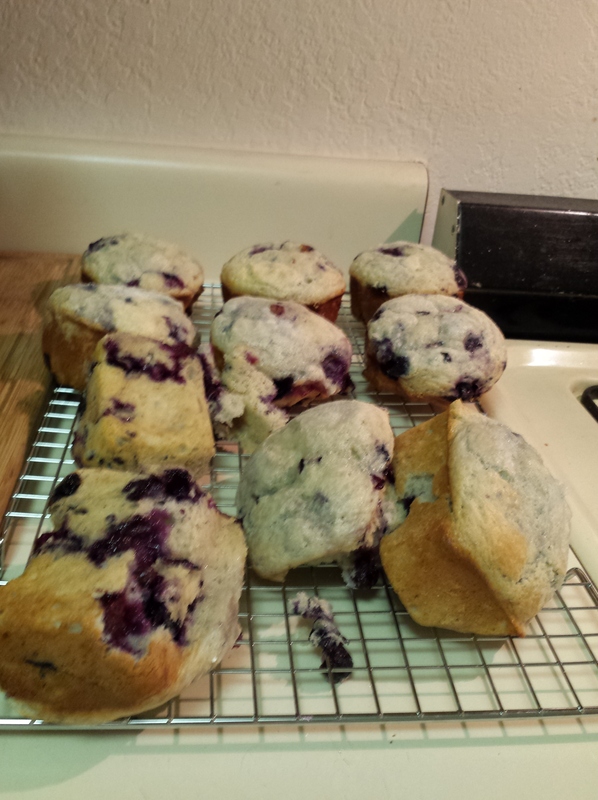 Fold in the blueberries (lightly dust them with flour so they don’t sink to the bottom of the muffins). Bake at 400 degrees for 20-25 minutes. Well, after almost 2 years, I have decided to start blogging again. This is the 2nd time I have come back to blogging, but this time I am not going to put as much pressure on myself to blog or link to other sites…I am just going to share my projects and see where it takes me. The last 2 years have been quite adventurous and crazy…and I am looking forward to getting back into my hobbies and finding some down time in the process of creation. 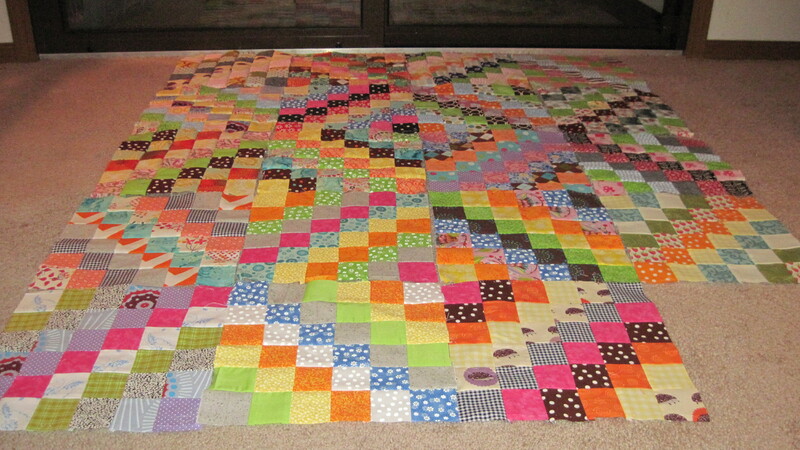 I am still going to post about quilting, cooking, crafting, etc…and whatever else my heart is lead to post. 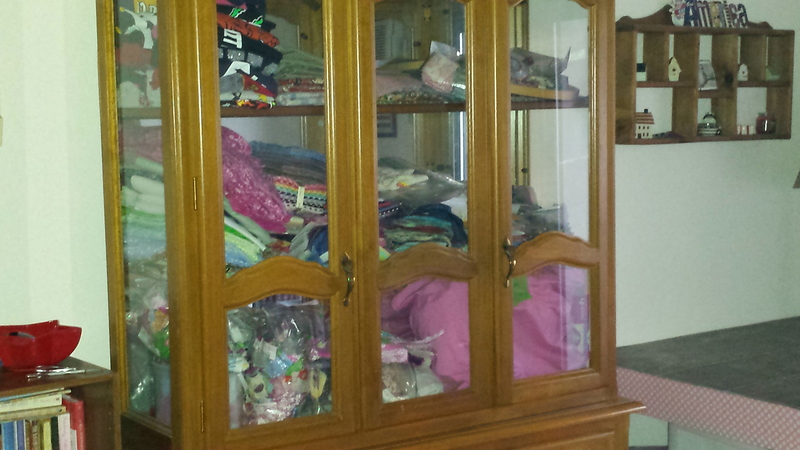 As you can see, this is my fabric stash….my unorganized fabric stash. I have lots of WIPs in there, but how many and what they are, I have no idea (more like I can’t remember). I am going to sort it out, look at what fabrics I have and get a list together of projects to finish and projects that I want to make. Baby steps. That’s what I call it. Baby steps. 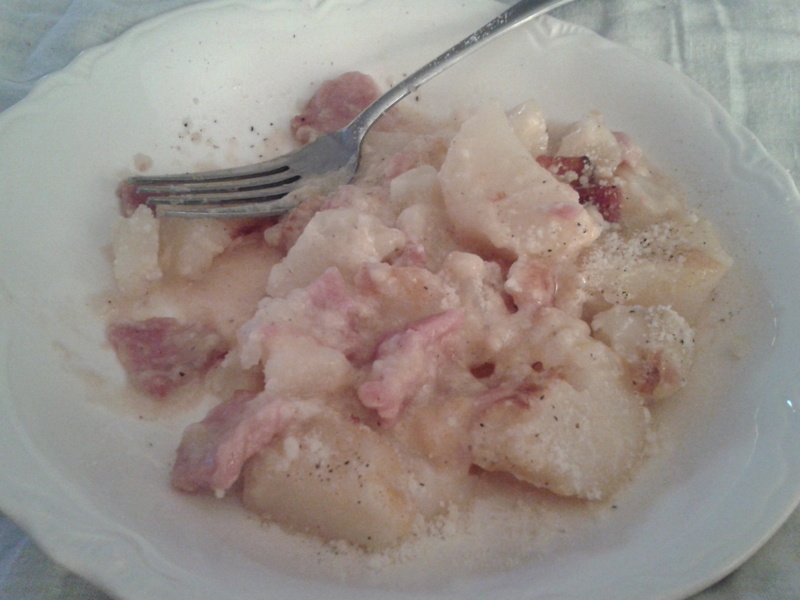 I can’t even believe that I am blogging this, but I made scalloped potatoes and ham for dinner. The reason I say this is because I do not like scalloped potatoes and ham. I am not a fan at ALL of white creamy sauces. I don’t like cream of anything soups, white gravy, or (and yes, I’ll pause for the collective gasp after I say this) alfredo sauce. But…this recipe and dinner tonight was AMAZING. And easy. And only roughly 500 calories a serving. Brown butter in large nonstick skillet, add flour and mix into a rue and let get brown, but make sure it doesn’t burn. Add milk, stirring and bring to a rolling boil. Add onion and garlic powder and pepper. Stir. Add potatoes and bring back to a boil. Add ham and 1/2 of the shredded cheese, mix well. Spray a 9×13 inch baking dish with cooking spray. Dump everything from skillet into baking dish and sprinkle the remaining cheese on top. Cover with foil and bake at 375 degrees for about 45 minutes. Remove foil and continue to bake another 30 minutes or until bubbly, thickened and looking incredibly yummy. I served mine with just a sprinkle of parmesan cheese. Oooh so yummy. I love Moda Fabrics. 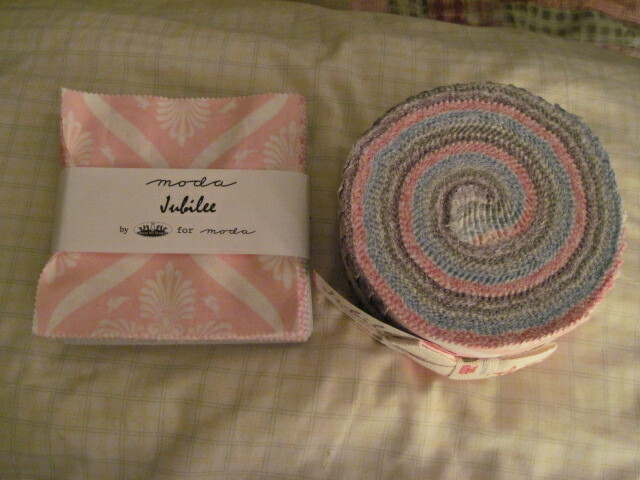 And these are some additional fabrics I needed to complete my Jubilee 16 patch project I talked about here. I love this line of fabrics. They are a combination of all of my favorite colors. 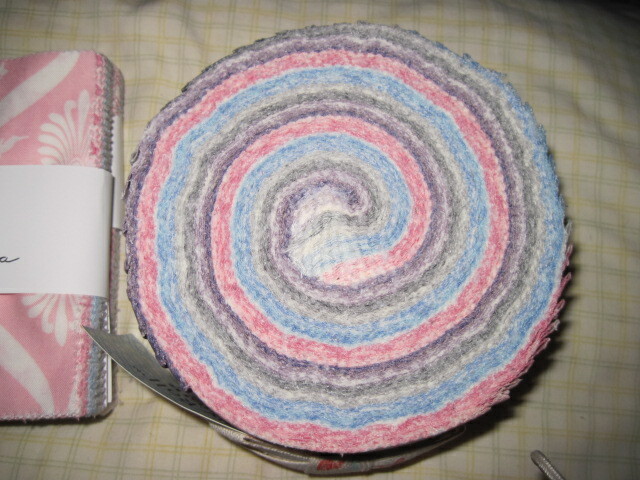 I love how a jelly roll looks before it’s opened. So marvelous. 4.basting, quilting, and binding Gabby’s quilt. More of my #scrappytripalong. I am loving making these blocks and loving playing around with placement. I also am enjoying figuring out how to fully use my camera (yes I got some batteries!). 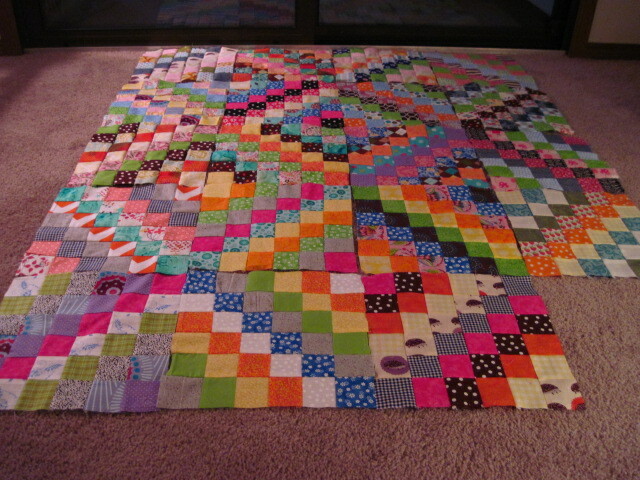 I have a couple more blocks to make to complete this quilt, but I think I am going to make all the blocks I have cut and then put them into 2 quilts. Meanwhile, I am enjoying the process…which is what I wanted to do! Linking up to Plum and June.